ACON Health, 2016, Smoke Free Still Fierce, graphic, viewed 15 December 2017, <https://www.acon.org.au/who-we-are-here-for/women/smoke-free-still-fierce-project/&gt;. ACON Health, 2016, Smoke Free Still Fierce, video recording, viewed 15 December 2017, <https://www.youtube.com/watch?v=1yRTLpOqzTk&gt;. ACON Health, 2016, Watch Michelle’s Story, video recording, viewed 15 December 2017, <https://www.youtube.com/watch?v=0M2qlxJquj4&gt;. Agnew-Brune, C. B., Blosnich, J. R., Clapp, J. A., Lee, J. G. L., 2014, ‘Out smoking on the big screen: tobacco use in LGBT movies, 2000-2011, Tobacco Control, vol. 23, no. 2. Lee, J. 8., 2008, ‘Big tobacco’s spin on women’s liberation’, The New York Times, October 10, viewed 14 December 2017, <https://cityroom.blogs.nytimes.com/2008/10/10/big-tobaccos-spin-on-womens-liberation/&gt;. LGBT Health Equity, n.d., infographic, viewed 16 December 2017, <http://www.outsmartmagazine.com/2014/01/lgbt-people-spend-7-9-billionyear-on-our-biggest-health-problem/&gt;. Malone, R. E., Offen, N., Smith, E., 2008, ‘Tobacco industry targeting of the lesbian, gay, bisexual, and transgender community: A white paper’, IDEAS Working Paper Series from RePEc. Quinlan, C. 2016, ‘How the tobacco industry exploits LGBTQ people’, The Establishment, November 11, viewed 15 Decmber 2017, <https://theestablishment.co/how-the-tobacco-industry-exploits-lgbtq-people-15c58364f2bc&gt;. 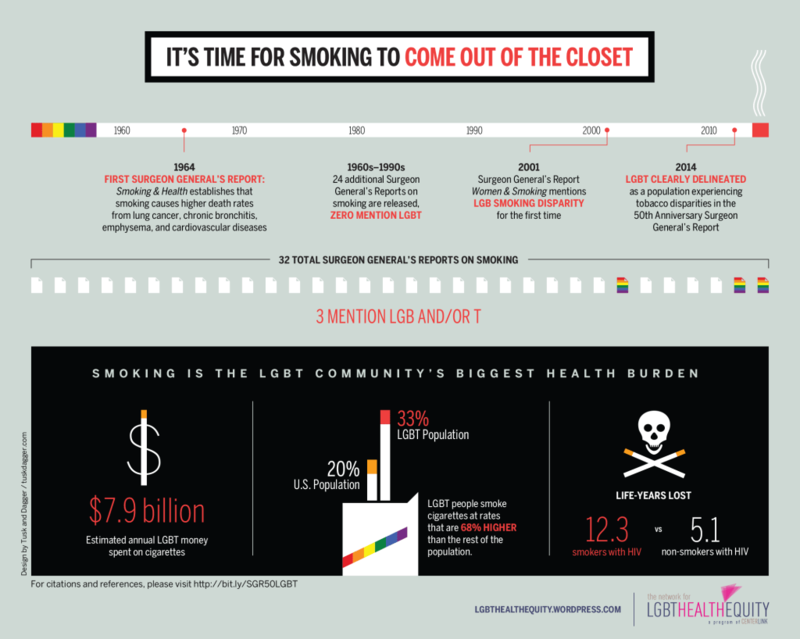 Truth Initiative, 2017, Tobacco is a social justice issue: LGBT communities, viewed 15 December 2017, <https://truthinitiative.org/news/tobacco-social-justice-issue-smoking-and-lgbt-communities&gt;. Wade, M., 2016, ‘Fierce campaign targets queer women’, Star Observer, May 10, viewed 16 December 2017, <http://www.starobserver.com.au/news/national-news/fierce-campaign-targets-queer-women/149102&gt;.